The chairman of the Texas Senate’s Criminal Justice Committee quashed an internal investigation of a female state trooper with whom he had an affair, according to an amended federal lawsuit filed this morning. The lawsuit alleges that Senator John Whitmire (D-Houston) intervened with Texas Department of Public Safety Director Steven McCraw to terminate the investigation of Trooper Diane Martinez and Captain Rolando Rivas. Whitmire’s committee oversees DPS. 47. In April of 2016, Corporal Katherine Gibson (formerly Creekmore) filed a misconduct complaint against Captain Rolando Rivas because he was showing favoritism toward a subordinate, Trooper Diane Martinez, with whom he appeared to be having an inappropriate relationship. OIG [i.e., the DPS Office of Inspector General] initiated an investigation, and within a matter of weeks Captain Rivas began cleaning out his office. At one point, the captain’s secretary discovered a note in his office that caused her and other co-workers to fear that Captain Rivas might harm himself. A short time later, however, the chairman of the Texas Senate’s Criminal Justice Committee intervened with Defendant McCraw on behalf of Captain Rivas, and the OIG investigation was quashed. As it happens, Trooper Martinez had boasted about having an intimate relationship with the married committee chairman, Senator John Whitmire. 48. After Defendant McCraw quashed the investigation, Captain Rivas was allowed to resume his position in Cpl. Gibson’s chain of command. Predictably, he began retaliating against her with numerous bad-faith accusations and disciplinary write-ups. The stress became so severe that Cpl. Gibson sought and obtained medical leave in May of 2017 due to harassment from her chain-of-command. She filed a second misconduct complaint against Captain Rivas in July of 2018, as well as complaints against Lieutenant Glen Lester and Sgt. Rito Morales, because of the ongoing retaliation scheme. Since that time, Defendant Fleming has deliberately slow-walked the investigation, Lieutenant Glen Lester and Sgt. Rito Morales have been allowed to transfer and Captain Rivas is scheduled to retire on February 28, 2019. This is standard operating procedure for Defendant McCraw and Defendant Fleming. When they can no longer cover up misconduct by a senior officer, the investigation is delayed and the senior officer is allowed to retire quietly… By delaying her findings, Defendant Fleming can close the investigation without sustaining any of the allegations. As a result, the report will not be subject to public release, and DPS will be saved from embarrassing revelations. In the interest of full disclosure, I filed the amended lawsuit on behalf of my client, Trooper Billy Spears, who was punished in 2015 for allowing himself to be photographed with Snoop Dogg at SXSW (the incident made international news and resulted in continued retaliation against Trooper Spears). Captain Rivas and Trooper Martinez were added to the complaint in order to demonstrate a pattern of corruption, cronyism, and cover-ups at DPS. 44. OIG is rife with its own misconduct and conflicts of interest. When Defendant Fleming became inspector general, she drove out most of the personnel selected by her predecessor and began replacing them with female officers, several of whom she either had or was having sexual relationships with. While she was a sergeant and serving as a counselor for Trooper Recruit School B-2002, Defendant Fleming carried on a romantic affair with one of the female recruits and later lied to cover up the affair. She is totally unfit to serve as inspector general, but the Commissioner Defendants keep her employed because she is quite effective at damage control. I’ve received tips from all over the state since filing suit on behalf of Billy Spears and retired DPS Special Agent Darren Lubbe, so much so that I’ve had a hard time keeping track of all the information. Nonetheless, please keep sending those tips. 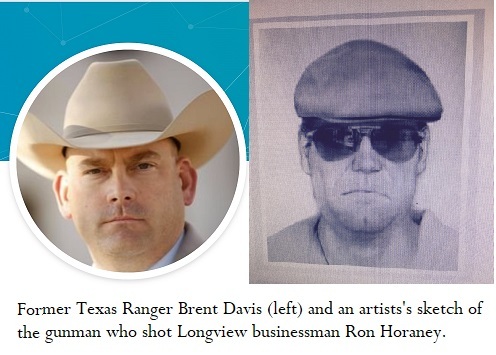 On January 18, 2019, I reported about OIG’s investigation of former Ranger Brent Davis, who was demoted because he was caught having an affair with a widow while he was supposed to be investigating the murder of her husband, businessman Ron Horaney of Longview. The investigation was a typical OIG sham, and I’m trying to track down some game wardens and Special Ranger Team members who may have heard Davis make incriminating statements while he was allegedly drinking at a campfire. Every cop or former cop with whom I’ve spoken thinks Mr. Davis and the widow should be at the top of the list of suspects. Consider the images on the right, which have been circulating among DPS employees. On the left is a picture of Mr. Davis, and on the right is an artists’s sketch of the gunman who killed Mr. Horaney. Draw your own conclusions. During his OIG interview, Mr. Davis predictably exonerated himself of all suspicion, e.g., by stating that he had no connection with Mrs. Horaney prior to the murder. According to records and audio released by DPS, however, the OIG investigator never attempted to corroborate Mr. Davis’s self-serving statements. At least one statement Davis made during the August 2017 inspector general’s interview was disputed on Tuesday by Gregg County Sheriff Maxey Cerliano, who previously was assistant police chief in Kilgore. Describing a close professional relationship that began when Cerliano hired him onto the Kilgore police force, Davis told Negri the sheriff had assured him the affair would not prevent Gregg County from seeking his assistance again. Davis said he had sought out his former boss, now the sheriff in Longview, to apologize for the affair. Cerliano disputed that, but he might have taken greater offense to public release of the internal affairs interview. If Mr. Davis’s self-serving statements about his relationship with the sheriff were untrue, which of his other self-serving statements are untrue? No offense to the sheriff, but the investigation is badly tainted, and it’s high time someone from the outside (maybe the FBI?) took over from the sheriff’s office and DPS. In my January 18, 2019 blog post about Mr. Davis, I included a link to a story (actually, a letter to the editor) about a ranger who initiated an affair with the mother of a teenage murder victim. Predictably, that family was destroyed (as if the family had not suffered enough already). Shortly thereafter, a former DPS employee made me aware of another incident. Following the murder of “American Sniper” Chris Kyle and his business partner, Chad Littlefield, one of the rangers investigating the murders impregnated Mr. Littlefield’s widow. Can’t these rangers find a better place to pick up women than murder investigations?